It’s hard to live when you’re certain only of the correctness of despair. Each day, climate crises give us evidence of our destruction; each day, we have for that correctness the most evidence in history. Why tell a story about the pains of some Christians today? First, because despair lives in certainty. Second, because Judeo-Christian thought is the longest record of doubt accessible to those most responsible for climate crises: English speakers. 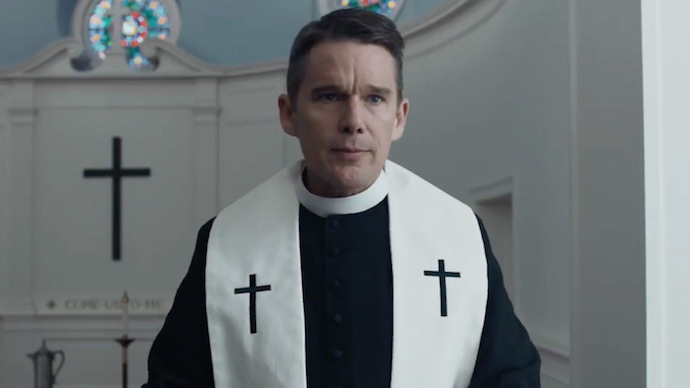 First Reformed is intimate only with a reverend named Toller. We hear his thoughts as he writes them down, confessing his failings like Augustine. The rest of the film is a question: how will this despairing man die? Michael and Toller discuss whether or not life, given despair, is worth living. Michael is certain about the sterility of the future, and thus wants to kill his wife Mary’s baby to spare it from known pains. Toller encourages Michael to preserve, saying that the passage between hope and despair is all life is. Later, Mary shows Toller her husband’s homemade suicide vest. Toller takes it away. The next day, Michael invites Toller to witness his corpse. Michael has destroyed his head, the seat of certainty. “I thought things could change,” Michael says before his death. Stasis is torture. Toller sees in the suicide vest armor and armament. Weapons have no loyalties; Toller begins to plan his war. Despair is contagious, and works like beauty. Its contagion is aesthetic. Once Toller has come to see what Michael sees—polluting cars, immortal plastics, tires like empty eyes staring in every direction—he cannot see otherwise. There is only one way to become blind. Toller’s care for Mary the widow makes him abandon his plan to disappear. Instead, he wraps himself in barbed wire, pain calming him enough to drink a final poison. Unless you grant a miracle, the film’s last shot depict a dying man’s fantasy: we swirl around Toller and Mary embracing and kissing, desperate to become less themselves and more each other. The body yearns to live, but the only living which bequeaths life is carnal. Toller knows this, and has known it—he made with his wife a child. What his despair cannot admit is that the future needs only touch. Toller and Michael are white, cisgender, heterosexual men. Neither are materially poor. Before killing himself, Michael admired José Cláudio Ribeiro da Silva and his wife Maria do Espírito Santo, Brazilians who were murdered for protecting their home state. Michael also admired Dorothy Stang, a Brazilian nun who was murdered for helping peasants protect themselves against loggers and ranchers. After Michael’s suicide, Toller sews a picture of José and Maria into the suicide vest, over the heart. Neither Toller nor Michael needed to even risk death in order to do good work, yet both kill themselves. José, Maria, and Dorothy did not kill themselves; they did not seek martyrdom. Instead, they struggled to live in order to do good works. They risked murder in their quest for more and better life. What would happen if white men, in response to despair, chose instead to follow the example of oppressed peoples? Before his death, Toller speaks with Jeffers, the megachurch’s leader. The leader encourages Toller to spend time in the new church, to get out of the old church, which is a joke to the kids. Toller reminds us that the children call his church “the souvenir shop.” Like the industrialist praising an apple pie for being “organic and local,” it seems to Toller that everyone else lives according to values divorced from their consequences. The old church—the church demanding sacrifice for the sake of charity—has become a home only for itinerants and tourists. It survives only by its status as an artifact. Hypocrisy. Cowardice. Sterility. We do not hear the last words Toller writes. His war, a relic of the fascism so frequent in history, returns. When he dons the suicide vest, he cuts us off from his struggles, having found “a new form of prayer.” It is at that point—not when he finally kills himself—that Toller disappears. The film is narrower than others because its vision is hemmed in by certainty. The film is less colorful than others because its people believe only the binary of abundance or sterility. The film is more geometrical than others because our relentless series of lethal todays is logical. The film is quieter than others because its violence erases quietism. The opening shot is a blackness into which light is slowly leeched, revealing from the perspective of a child Toller’s church. We see how its white face chips. We see its hardness angling into a blank sky. We see a rusted plaque purporting the building’s history. We are made to gaze so uncharitably before we see the person who mends and ministers to this house of God. The edifice is thankless. It is all we look up to. Could it be otherwise that its dependents destroy themselves? The film’s first phenomena are wind rustling trees and singing birds. Today, it is doubt that grounds hope (a relation spoken by many Christians in dark nights). Not a doubt in our scientific accounts, but a doubt towards the story of our end, a tale so serviceable for fatalism and apathy. Every act of preservation strengthens the doubt we may hold as a vigil for all yet to come.